ONE HOME, ONE BUYER, ONE DREAM AT A TIME. ROBERT R BAUER BUILDING CONTRACTORS INC.
Make this the year you transform your outdoor space into a functional and beautiful place to relax and entertain! Our national award-winning team can help you explore an array of exciting possibilities. Whether you are interested in an elegant patio, deck, lakeside pathways, outdoor kitchen, fire pit, pool, hot tub, pergola or complete outdoor living space, weâ&#x20AC;&#x2122;ll make your back yard your favorite destination! With enhanced services and amenities, expanded walking trails, new lakeside garden homes and diverse opportunities for enjoyment, The Summit Life Plan community makes getting the most out of life easy! Offering you customizable and maintenance-free homes, plus priority access to healthcare right on campus â&#x20AC;&#x201C; life at The Summit means peace of mind. Fill your day with a variety of activities on and off campus, (four golf courses nearby!) or sit back and relax in your new home...the choice is yours. Call today to start planning your future at The Summit! Marine has been a family owned and operated, full-service marine center on beautiful Smith Mountain Lake, VA. Boasting the largest inventory of deck boats, pontoons, and Sea-Doo watercraft in Southwest Virginia, Webster Marine offers new and pre-owned boat and Sea-Doo watercraft sales, as well as service, parts, accessories and slip rentals. Conveniently located next to Halesford Bridge, stop by and visit us today. “Now Serving Non Ethanol Gas 24/7” ®, TM and the BRP logo are trademarks of Bombardier Recreational Products Inc. or its affiliates. Experience the difference Landscaping is an extension of your home. It’s your vision. With attention to detail, dependable maintenance and a commitment to quality, we strive to meet that vision. You will experience the difference. who wrote the book, whether buying or selling. Huge selection of AMERICAN MADE outdoor furniture that lasts. Smith Mountain Lake HOME is published annually by West Willow Publishing Group, LLC. For advertising information please call (434) 386-5667 or email sales@smlhomemagazine.com. 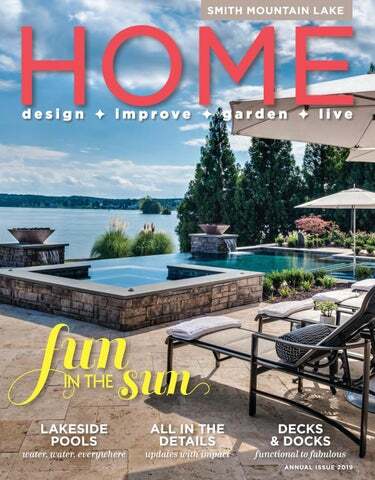 To discuss coverage of an event relating to home or garden, please contact Smith Mountain Lake HOME at info@smlhomemagazine.com. Copyright 2019 by West Willow Publishing Group, LLC. All rights reserved. No part of this publication may be reproduced or transmitted in any form or by any means without written permission from West Willow Publishing Group, LLC. All pictorial material reproduced in this magazine, whether in a produced ad or by itself, has been accepted on the condition that it is with the knowledge and prior consent of the photographer or the artist concerned. 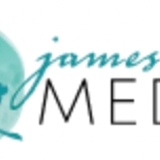 As such, West Willow Publishing Group, LLC is not responsible for any infringement of copyright or otherwise arising out of publication thereof. The information contained herein has been obtained from sources believed to be reliable. However, West Willow Publishing Group, LLC makes no warrant to the accuracy or reliability of this information. Opinions expressed in this magazine are those of the authors and do not necessarily reflect the opinions of ownership or management. PUBLISHER’S note One of the many pleasures of owning a Smith Mountain Lake home is having a place for making memories with family and friends. Of course, all that’s really required for good times is the company of others, but a well-planned, aestheticallypleasing and comfortable space can elevate your gatherings, adding an element of warm hospitality. In this 2019 issue of Smith Mountain Lake HOME we offer fresh ideas to elevate any home from ordinary to warm and inviting. All of us at HOME magazine strive to be the goto resource to provide inspiration to SML homeowners. We showcase local style and connect you with the companies that can help you execute your plans and projects. There are so many talented and unique local businesses serving the Smith Mountain Lake area offering products and services to help you define your individual style and elevate your personal space. HEAD POOL HARDSCAPE & LANDSCAPE: CLC, Incorporated POOL: National Pools of Roanoke, Inc.
RUNK POOL HARDSCAPE & LANDSCAPE: Creative Outdoors POOL: National Pools of Roanoke, Inc.
he bar is a crucial element to pulling off home entertaining and can make your house the coolest one on the lake. Whether you are having a big bash with your entire posse or a quiet evening at home sipping a cocktail with your spouse, the home bar can transform the way you entertain. From a simple bar cart topped with the essentials to a freestanding bar with all the trappings, there are plenty of ways to create a watering hole within your own home. If you are looking to create a full-on cocktail lounge or pub in your home, you’ll need to install a wet bar or free-standing bar. In advance, determine where you have space and do a majority of your entertaining. Do friends and family hang out in the family room on most weekends to watch the game? Or do you have a sprawling basement that can be transformed into an entertainment hub with a saloon? If you like to entertain outdoors, will the bar be conveniently located near a deck or terrace? Before you start ordering materials and hiring workers to build your bar, if you are looking to include a sink or ice maker in your setup make sure that you have the appropriate plumbing in place. With infrastructure in mind, install your bar on a wall where pipes already exist, near the kitchen or a bathroom. If you are having your bar designed by a kitchen designer or interior decorator, consider including restaurant-grade equipment, beer and wine taps, and other high-end equipment like ice machines and specialty beverage refrigerators with dual zones for chilling brewskis and wine. Also, consider the style and design of your bar. If you want to sip piña coladas and feel like you’re vacationing on a tropical island, create a vintage tiki bar. For the beer-drinking soccer fan, naturally you’ll gravitate towards the style and atmosphere of an Old English pub. If you are handy and looking to DIY the job, you can easily install a bar with pre-fabricated cabinets from the hardware store and then top it off with a stone slab sourced from a rock yard. Wine coolers or mini-fridges can be popped right into place with no trouble, as they are designed to fit pre-fab cabinetry. Open 7 days accepting quality furniture, home decor & more! Call us with your needs. or clothing can be transformed into a place to tuck all your hooch away behind closed doors. Or consider other furnishings for your liquor setup, like a narrow console table, midcentury modern record cabinet, or antique secretary’s desk. If you are handy, strip down the furniture and refinish it for an updated look. own a shaded lane, away from the lively festivities of Smith Mountain Lake State Park and the Kings Point Pub, a sprawling ranch with gray shingles overlooks a serene cove. Small solar lamps light the curved stone pathway lined by planters brimming with seasonal color; a cheery garden flag welcomes guests. It’s a delightful picture and one that would make anyone fall in love with lakeside living. Indeed, Chris Mabry has always loved Smith Mountain Lake and once owned property in the area. It was his desire to have his own weekend spot at the lake again that ultimately drove him to find his ideal SML home. He began his search on the Huddleston side of the lake for convenience—it’s only a thirtyminute drive to Huddleston from his primary residence in Forest. It wasn’t long before Chris found himself at the closing table in March 2017 to finalize the purchase of his new place. Filled with natural light, waterfront scenes, and small luxuries, it seemed almost perfect; still, Chris saw ways to add his own touches and upgrade the property. One added bonus of buying off-season included beating the summer rush to improve landscaping. He enlisted the services of the Southern Landscape Group to enhance his new home’s landscaping and hardscaping. He also contracted Floyd Enterprises to complete the unfinished portions of the lower level, along with updates to the screened porch, interior flooring, and dock work. Chris didn’t have to dread the seemingly common waiting period between construction and completion; he was able to enjoy his new home immediately. “None of the renovations at the time were upstairs,” he explains, since most of them were outdoor or basement improvements. He lucked out: all of his contractors completed the work by Memorial Day. “It was amazing because it rained every day in May but two that year—I know that for a fact!” he laughs. “Southern Landscaping came the week before Memorial Day and sodded everything to where I had a perfect yard for Memorial Day weekend.” Chris and his girlfriend Debbie come to the lake every weekend. They entertain Debbie’s son along with Chris’ three grown daughters and four grandchildren: Mason, Jensen, Izzy, and Myles. Two of his children live in the local area and one lives in Charlotte, North Carolina. “I also have my managers up a couple of times a year,” he adds. With six bedrooms and five and a half baths, the house provides plenty of room for a growing family as well as friends and colleagues. Guests feel welcome here as soon as they walk through the door. A framed set of rules hangs over a cherry red console, inviting guests to “Wake up late, go on a hike, catch a fish, take a nap, catch fireflies, and wish on stars,” ultimately setting the tone for this casually elegant and traditional lake house. A few steps to the right, a large openconcept space offers a 180-degree view of the cove. Drenched in sunshine, this is the hub of family life indoors. Dressed in the classically nautical palette of red, white, and blue, Chris and Debbie’s thoughtful furnishings all point to relaxation in this lakeside locale. The den features a 55-inch flat screen TV anchored above a white brick gas log fireplace; striped easy chairs and sofas gather on a cabana-striped rug and provide seating for watching the game or cozying up by the fire. Throw pillows and wall decor add to the coastal motif, and several sliding doors take advantage of the stunning scenery as well as facilitate the ease of indooroutdoor living. An openconcept gourmet kitchen leads to a screened porch with adjacent deck, offering plenty of space for dining al fresco. more time on the screened porch. It’s nice and comfy out here.” To the right of the porch is a deck with built-in seating; to the left, a bistro-like area with umbrellas over round tables for dining al fresco. Back inside, a hallway with built-in cabinets connects the family room to the sleeping quarters. While Debbie did most of the decorating (“She would love to own her own decorating company one day, and I think she could really do it!” Chris says enthusiastically), he outfitted the hallway himself. Chris shopped locally for SML-inspired finds, like a model ship, anchors, and oars from Cottage Gate. Framed family photos with happy lake memories rest above the cabinets that store towels, boat bags, sunscreen—everything you might need for enjoying the lake. Builds Central Virginia's Finest Homes Whether you are looking to build a new home or renovate an existing one, our in-house design staff and master craftsmen pride ourselves on walking our clients on a path to make their dreams become reality. If details and the highest quality are what you desire, call us today to start the EXPERIENCE. The homeâ&#x20AC;&#x2122;s exterior features a fire pit and two docks. The main dock boasts a refrigerator, Wi-Fi, sound system, and 55-inch TV. We Specialize in Beautiful Decorating We make the process of interior design easy and fun for our clients. We listen to your design dreams and create a customized, functional design and product plan just for YOU! Our consultation is complimentary. No matter what your overall budget is, it’s important to understand the costs of the individual elements you choose. Your designer should be able to suggest multiple options to achieve your preferred look at different price points. They can also help you find less expensive sources for materials, says Maslow, who recommends looking for deals from local stone yards that are trying to liquidate extra stock. One of the main draws of living in this beautiful area is, after all, to enjoy it. The right pathways and steps will allow you and your family to make the most out of your property for years to come. ✦ PHOTO: CLC, INC.
WATER PROBLEMS? GIVE US A CALL AND SAVE THOUSANDS. Landscaping • Seeding & sodding • Hydroseeding • Lawn Care • Paver driveways • Paver walkways • Paver patios • Tree services • Retaining walls • Paver & Retaining wall repair • Firepits • Outdoor living spaces • Custom stonework • Water & erosion control • WE NOW OFFER MULCH BLOWING. Having inviting guest quarters for overnight visitors is the most important hospitality you can provide, and a bit of thoughtfulness and effort here goes a long way. A comfortable bed with fresh linens, and ample pillows and blankets is a must. The B est Decision you w ill e ve r m ake ! Westminster Canterbury has the honor of being rated five stars by U.S. News & World Report as one of the Best Nursing Homes in the nation again this year! Our beautiful, 42-acre campus and nationally-recognized LifeCare program can offer you, or your family member, a unique experience. * Westminster Canterbury of Lynchburg, VA has been rated and recognized by U.S. News and World Report and does not imply an endorsement. Retirement doesnâ&#x20AC;&#x2122;t have to be boring. Meet new, interesting people and enjoy a sense of community. Try swimming in our indoor saltwater pool. Share memories with friends while eating at one of our three dining locations or enjoy scenic and interesting trips with new friends. Discover all you can do at Westminster Canterbury and experience life refreshed. We all know the best pizzas are made in the hottest ovens, but as the temperature rises outside, many of us prefer not to heat up our kitchens. A fancy brick oven is not required to make a tasty pie. A grill, a Green Egg, or a Pizza Kettle can produce delicious pizzas with crisp crusts and a bit of smoky char. Making pizza on the patio is great for entertaining. The hosts can mingle with guests instead of being stuck in the kitchen, and everyone can be involved. Whether it’s a simple family dinner or a party for 10, making your own pizza is just plain fun. You can make dinner with wine glasses in hand, and everyone can create their favorite combinations. The key to really good pizza is of course, the crust. Pizza dough can be purchased from a pizza parlor or grocery store, or you can easily make your own. I’ve experimented with several recipes, and I love the versatility of this one by Faith Durand at The Kitchn. It gives you the option of making pizza with only a short rise time for the dough, or making the dough ahead and refrigerating it up to three days, or even freezing it for later use. 1 2/3 cups water 1 to 2 teaspoons active dry or instant yeast * ½ teaspoon sugar ¼ cup olive oil 5 cups all-purpose flour 2 teaspoons salt * If you want to use the pizza dough that same day, use 2 teaspoons yeast. If you are going to let the dough rise overnight, use 1 teaspoon yeast. A side note about using yeast—for some reason, lots of people are terrified by it. Don’t be, it really is simple. The temperature of the water is important—too hot and the yeast dies, too cold and it doesn’t activate. 110 degrees is recommended, but don’t worry if you don’t have a thermometer. Run your tap until the water feels warm, then bump it up until it feels hot, but not hot enough to wash dishes with. That’s your sweet spot. Mix the water and yeast together in the bowl of a stand mixer or a large mixing bowl. Add the ½ teaspoon sugar and stir. (The sugar feeds the yeast and speeds up the process.) Let stand for a few minutes until the yeast is dissolved and starts to foam. This may take five to 15 minutes depending on how warm your kitchen is. Stir the oil into the yeast mixture, then add the flour and salt. Mix with a spatula until a shaggy, floury dough is formed. Kneed the dough on low speed with a dough hook for five to seven minutes, or knead by hand on the counter for six to 8 minutes. When kneaded, the dough should form a smooth ball, feel smooth to the touch, and spring slowly back when poked. Use a knife to cut the dough into 8 lumps. Grease a baking pan lightly with olive oil. Place the dough balls in the pan and turn them over so they are coated with oil. Cover the pan with plastic wrap or a damp kitchen towel. Let the dough rise at room temperature for 1 to 1 1½ hours, or until it has doubled in bulk. At this point the dough can be used immediately, or refrigerated or frozen for later use. Place the covered pan immediately in the refrigerator and let it rise slowly overnight or up to 24 hours. Before making the pizza, remove the dough from the refrigerator and let it sit at room temperature for at least one hour. Preheat your gas grill with all the burners on high for 10 to 15 minutes. (Alternatively, start a charcoal grill.) Once heated, turn off or lower half the burners, creating an area of direct heat and an area of indirect heat. (If using a charcoal grill, create the same areas by banking the charcoal.) Set up a workspace near the grill with space for shaping the pizza and bowls with sauce and toppings. Working with one piece at a time, pull and stretch a dough ball in your hands into a round. Once it becomes large, drape it over your fists to continue stretching it into a large, thin round. Or you can also roll or pat it into a rustic oblong shape. Aim for about ¼-inch thick. I like to do it directly on a lightly floured pizza paddle for ease. Brush dough with about two teaspoons of olive oil. Flip the shaped pizza dough onto the grill over the direct heat and close the grill. Once the crust looks set, turn it over. This should take about two minutes. Remember every grill is different, so time can vary. Use tongs to flip the crust over and move it to the indirect heat. Quickly spread it with sauce and then a thin layer of toppings over top. Don’t overdo the toppings as this will interfere with it cooking quickly and thoroughly. Close the grill and cook until the toppings are warmed through and the cheese is melted, another two to three minutes. Again, times will vary. If pizza smells like it is scorching, rotate it into a cooler spot. Slide the finished pizza onto a cutting board. Cut the pizza into slices and serve. Repeat with the remaining pieces of dough; as you get more practice, you can start a second pizza over direct heat while the first pizza is finishing over indirect heat. If you prefer thin and crispy pizza, you can roll your dough out thinner and use a pizza stone. Just make sure to place the stone on the grill before heating. This will ensure it is as hot as the grill and also prevents it from cracking. If your dough is too thin, it has a tendency to fall through the grates. My favorite red sauce for pizza is canned San Marzano tomatoes, crushed by hand and spread in a thin layer on the crust. It’s light and fresh and tastes like Italy! Sprinkle with salt and pepper and you’re ready for the toppings. However, if you want more of a “sauce,” your local market has many choices in jars, cans, or freshly made in the deli. Pick one you like and keep it simple. Take a good look at your closets and ask yourself if you are really using the space to its full advantage. Are there large areas of white wall space with nothing on it? Are you using all the space up to the ceiling? How about the floor—is there space above your shoes that could be better utilized? If you have the means, one of the best ways to maximize your space is to invest in a professionally designed and installed closet system. There is a range of prices from semi-DIY to fully customized that will ensure no square inch goes to waste. Begin by checking your local area for quality closet designers and call for a consultation. They can share ideas and price out a revamp of your space. Alternatively, stock storage systems (like Elfa from The Container Store) are available online or from the local big box store, and can be installed either professionally or DIY to transform a mediocre closet into a fantastic wardrobing space. In addition to standard clothing closets, you may be able to convert additional space for a more needed use. Bathroom closets meant for toiletries can become handy linen closets for guests, with decorative baskets for holding washcloths and hand towels. Or make closets serve two purposes. Use the shelves for linens and add hanging door racks for soaps, and tuck smaller bins between towels for other toiletries. Search local stores for creative storage products. Try wire racks that slip under existing shelves so you can utilize the additional space. Add risers and stackable shelves to lower cabinets to create more tiered storage. Drawer organizers can be used in bathrooms to help contain clutter—especially if you have deep drawers where you can add another tray. If your house lacks closets, you can invest in built-in cabinetry to create elegant and seamless storage. That could be building out a unit against a guest room wall to store clothing and linens, while still leaving room for a mounted TV to create a media room when guests aren’t visiting. Or it could be creating built-in cabinets and drawers against a bedroom wall to store clothes. As long as you have suitable wall space and the funds, you can hire local craftsman to build out custom storage that will blend right into your home. Can you cut a hole in a wall and take some space from a garage or other empty space on the other side of the wall? One area that is often available is under the stairs, where drywall can be removed, and shelves and doors can be built right in. You can also build around a large window, installing shelving and cabinets on either side, and adding shelving under the window, or even a bench, which can be both a reading nook and hidden storage. Entryways may provide some unused space that can be repurposed for storage, including building a bench with hooks and shelving to store bags and other daily use items. And of course basements often have an area where built-ins can be added. If custom builds are not in the budget, you can sometimes approximate the look and feel of custom closets with large-scale furniture and storage options from retailers (such as IKEA) that will allow you to purchase a bank of identical closed storage shelves that can be attached to a wall for safety. The uniform appearance can give the look of custom cabinetry for far less. If you want the storage without the permanence of built-in or attached cabinets, consider purchasing furniture that doubles as creative storage. In bedrooms, you can buy armoires and wardrobes to hold clothes and other items, which allow you to move them around if you redecorate. Shelving units—especially ones with square, box-like openings—can be fitted with decorative baskets to store linens and towels. You can also use galvanized steel tubs or canvascovered storage boxes for a different feel, depending on your decor. These are especially useful in guest rooms and dens, where you may need to tidy fast and keep things looking crisp and uniform. You can also achieve a great design look with wall-mounted shelves, taking them all the way to the ceiling to maximize that vertical space. Place multiple shelves in unused or underutilized corners or nooks to create a floating storage unit that doesn’t take up floor space. It’s 7am - Do You Know Where Your Pants & Shoes Are? are looking for a lower cost alternative to glass and wrought iron, vinyl railings and balusters are the perfect choice for your deck. There are so many benefits when using vinyl. Jason Nuckles, of the Vinyl Porch Rail Company in Lynchburg, says they receive a lot of requests for vinyl railings with composite accents. Vinyl is easy to install and is long lasting; according to Nuckles, “Quality vinyl will carry a lifetime warranty.” It also provides privacy, will not chip, crack, peel or blister, and is resistant to mold, mildew and pests. If you are looking for low maintenance, vinyl is at the top of the list. Enjoy! to schedule your FREE design consultation. The 12,000 square foot French country home is situated on a peninsula at The Water’s Edge in Penhook, and features breathtaking water and mountain views. was time consuming. Luckily, Bauer has a network of craftsmen such as stone masons and subcontractors, many of whom he has relied on for nearly 20 years, who worked on the house. Their familiarity with one another and vast experience in the building sector, according to Bauer, is what allowed them to finish a home of this complexity in a relatively aggressive timeframe. The bones of it were complicated to construct, with structural steel beyond the scope of most residential projects, Bauer recalls. It’s a smart home, and can be controlled from an iPad or phone. It has on-demand hot water and multiple heating and cooling zones. It has back-up generators, geothermal heating and cooling, and sensors to detect water leaks that can automatically shut off the water supply. That’s all to say, the construction was multi-faceted. As for the finishes, says Jeri of her husband Tim’s hands-on involvement with the project, “There was no detail left to chance.” The exterior of the house has a multi-level roof line and is L-shaped, sitting at the peninsula’s tip. A stone driveway leads to a three car garage, across from which is the main entrance— solid wood French doors with large glass panes. The doors are positioned so that you can see through the back windows and get a glimpse of the lake from the entry. “This was our second custom build, and that’s something I learned… you think about what the sight lines will be,” says Tim. The Lassitersâ&#x20AC;&#x2122; main living area is a five-sided space with vaulted ceilings and floor-to-ceiling windows. A warm, welcoming community in the heart of Roanoke Close to downtown, restaurants, hospitals and more. Brandon Oaks’ convenient location makes it ideal for those who want to ditch the responsibilities of a house, but still go and do things they love. All while knowing they will be taken care of, for life. A kitchen with custom cabinetry and a bank of windows leads to a morning room and screened porch. The main floor master suite features a stainedbeam vaulted ceiling, and a spacious bath with soaking tub. The stylish dock has room for plenty of personal watercraft, plus creature comforts like a bar, ceiling fan, and TV. Before you can choose your tomato varieties, you need to assess options for where to plant. Tomatoes are flexible, and can be grown in the ground, in raised beds, or in containers. But they do require a certain depth of soil, and most importantly, tomato plants need at least eight hours of full sun. It doesn’t have to be eight straight hours, though—it can be broken up into morning and afternoon hours. If you have a large backyard with a sunny area, you can plant directly into the ground or build a raised bed, which is a great way to control soil composition. If not, look for any area with enough sun, even the patio, driveway, or dock, and plan to use containers. And choose both tougher hybrids and more delicate heirlooms to hedge your bets. If bad weather wipes out your more tender varieties, you may still have your hardier plants. However, you should make your selection based on where you can grow them. If all you have is medium-sized containers, you may not be able to grow larger varieties. But if you have a lot of space or larger containers, you can choose almost anything. While selecting your tomatoes, buy some companion plants as well. Basil is a traditional companion plant, because the fruit and herb go well together in a myriad of dishes. But you can also grow flowers like marigold, which helps repel insects and provides a sharp burst of color to make your containers pop in summer. Or slip in a few pepper plants like jalapeños to plan for fresh salsa later in the season. There are two major types of tomatoes: determinate and indeterminate. Determinates grow to a certain size, bear fruit, and then stop growing and producing. They are perfect for smaller or medium-sized containers. An indeterminate will continue to grow, flower and bear fruit until frost or disease kills them, so it’s great for planting in the ground, raised beds or larger containers. As for varieties of tomatoes, visit your local garden center to see what choices are available. Be adventurous! Shop around for the greatest variety. Most garden stores will have a selection of disease-resistant hybrids as well as a few tender but delicious heirlooms. Read the descriptions of each variety, paying attention to whether it’s determinate or indeterminate, and the length of time from planting to harvest. Select a range of plants, from early harvest varieties like Early Girl, to later, larger heirlooms like the classic Brandywine. are significant construction projects that begin at about $60,000 to $80,000 and range well upward. Here, docks are used as outdoor living and entertaining spaces—suitable for keeping expensive boats, PWCs and myriad water toys, secure, but (ideally!) also able to accommodate a vacation onslaught of grandkids and their friends or a neighborhood sunset cocktail hour. the burning boards, improves footing, and reduces splinter injuries when the boards are real wood. Using yellow bulbs in your lighting plan will draw far fewer bugs, and low-cost home-store rope lighting overhead is a simple way to create a warm glow. A hammock hung between dock pilings makes a great shady spot for a nap or summer read, while a wireless speaker allows the playlist from anyone’s device to provide a musical backdrop for all the waterfront action. One final suggestion that’s key to safely enjoying your dock life: post a “House Rule” that requires kids to wear life jackets whenever they are on the dock or in the boat. It’s your dock, you make the rules, and this one is a prudent way to make sure kids stay safe. options now that you can go from highend to reasonably priced,” Dudley says. For example, if you see a high-end fixture that grabs you but don’t want to invest that much, take a picture of it to a designer, a local showroom, or search online for one with similar lines and materials. If you are updating fixtures for resale, buyers are gravitating to warm metals like burnished brass, gold and bronze. Farmhouse, industrial, and architectural shapes like globes are going strong. Organic-inspired fixtures with imperfect shapes are also popular, made with materials like ceramic and hand-blown glass. More fixtures than ever are offered in LED, which is especially trendy with eco-conscious homeowners. While LED lights once cast a bluish, cold glow, the technology has improved. The color temperature is now better, and the light can be indistinguishable from the glow of a traditional incandescent fixture. It’s a great option for hard-to-reach areas, like a chandelier in a two-story foyer, because LEDs last for years, so light bulb changes are practically eliminated. Keep in mind that you’ll pay more for an LED fixture, but will save in energy costs. A refreshing summer cocktail with a Caribbean twist, a dark ‘n’ stormy is made with dark rum, ginger beer and sometimes lime juice, served over ice. Gosling’s claims that the drink was created on the island of Bermuda, and therefore the true rum to use is Gosling’s Black Seal Rum. (But we won’t tell if you use another dark rum.) Ratios for these cocktails vary from two ounces of dark rum to three-to-five ounces of ginger beer. There’s debate about whether lime is traditional or not, but many aficionados feel the cocktail is tastier with a squeeze of juice from a lime wedge. You can also use a lime peel twist for an elegant garnish. This classic Kentucky cocktail is very easy to make. Take 2 ½ ounces of bourbon, muddle with about a dozen mint leaves and 1 ½ teaspoons of sugar, fill the glass with crushed ice, and add some club soda. Garnish with fresh mint sprigs. Also called a classic highball, you can mix a simple cocktail by adding two ounces of scotch whisky to two-to-four ounces of club soda served over ice. But you can also snazz up this simple drink with a dash of orange or other bitters. Or have orange or grapefruit peels ready to twist and drop in for flavor. When choosing a scotch for this cocktail, you need to aim for good quality brand, but not the highest end. High-end single malts like Glenfiddich and Macallan are intended for sipping— and the price reflects that. Aim for a good quality blended like Chivas Regal or Johnny Walker Red. Tequila isn’t just for margaritas. But you need to know what you’re buying, and select the best. Tequila is a type of spirit made using sugars of the blue agave plant. The purer form of this spirit will be made of 100% agave. It comes in various forms, with the more expensive forms including reposado, tequila that has been aged from about two months to up to a year a year, and añejo, which is aged between one and three years. Two top brands include Don Julio and Patron. Yet there is still more work being done on the Long Island Estates property. Caroline’s parents bought the house with the intent of making it a retirement destination. Tucked off of Virginia 122 near LakeWatch Plantation, the route to the house offers an inviting and peaceful drive through wooded land before reaching the narrow peninsula where it rests. Beautiful water views and inescapable serenity are hallmarks of this section of the lake. It was an ideal central location for the family—Caroline went to East Tennessee State University, her brother went to Virginia Tech, and her sister attended Longwood University. Though Caroline’s father was originally from Marion, Virginia, he and his wife lived in Northern Virginia. Smith Mountain Lake was a geographical focal point; it made sense that this should be where the family shared and celebrated its time together. “This was our meeting point for the short holidays and other family opportunities,” Caroline says. “Dad really enjoyed the pace and lifestyle of this area of Virginia.” Sadly, the unexpected passing of Caroline’s father just two years after buying the house changed everything. Without her husband, Caroline’s mother would never make the move to the lake full-time. The house was still a spot for the family to get together, but things weren’t quite right. BJ and Caroline talked to her mom about buying the home, with the plan of renovating it into something special. “We said to her, ‘Let us buy the house, we’ll renovate it, and we’ll keep it in the family for as long as we can,’” BJ says. The Funagarolis’ Long Island Estates vacation home is centrally located for various out-of-town family members to visit. The most stunning change the Fungarolis made was eliminating the garage and expanding the kitchen. Anchored by a large, granite-topped island, the room has become one of the homeâ&#x20AC;&#x2122;s most inviting gathering spots. The main living area was renovated to include a spacious kitchen and family room with vaulted whitewashed ceilings and skylights, imparting an airy feeling. Call 540-985-9160 for FREE estimates. Six bedrooms offer plenty of room for family and friends. other features (some of that space has been—or will be—supplemented with shelving and wardrobes). “We knew coming in that we weren’t converting this house for the resale but rather for our family,” BJ said. In all, the home has six bedrooms, and four full bathrooms. The highlight is the master bathroom, with dual vanities and a shower boasting tiled walls, a glass entryway and a showerhead mounted directly overhead. There are also easily accessible handheld showerheads here and in a downstairs bathroom to help expedite cleaning the kiddos or their dog after time spent outside. One renovated area that the couple are particularly proud of is the lower level of the deck, which was improved by a ceiling, screening, and fans. It gives the family a place to relax when the bugs are bad or when wet weather decides to sweep in. “It’s a great place to come have drinks, just another area for people to come and get a bit of privacy,” Caroline says. She says that this was the “smartest” addition they did in terms of extending the home’s livable space. The open basement features a second master suite and lots of open space for kids to play. As a part of the Smith Mountain Lake community for more than 30 years, our agents’ mastery of the local market will surely find you the property of your dreams. Call or visit us today and work with consistent leaders in sales and service, backed by a company you can trust. www.SmithMtnLake.com • 540-721-8659 ©2019 BHH Affiliates, LLC. An independently owned and operated franchisee of BHH Affiliates, vLLC. Berkshire Hathaway HomeServices and the Berkshire Hathaway HomeServices symbol are registered service marks of HomeServices of America, Inc.® Equal Housing Opportunity. All hail the versatile throw pillow! These small decorative items that adorn the corners of couches, the top of bedspreads, and the Adirondacks down on the dock are the workhorses of the decorating world. Most often found as 16- or 18-inch squares, throw pillows are found in a variety of shapes from plush rectangles, to round â&#x20AC;&#x153;pillboxâ&#x20AC;? styles, to cylindrical neck rolls. Thanks to their relatively diminutive size, comfort, and yes, versatility (most can be inexpensively changed out or recovered with the ease of a zipper or a button or two), they are widely used in all styles of decor today. Here Today, Here Tomorrow Given the non-stop consolidation in the banking industry, do you wonder if you are getting the personal service you deserve? For over 25 years, our focus has been on preserving our clients’ financial assets, managing growth, and efficiently transferring wealth from one generation to another. This stability of purpose allows us to provide the high level of personal service our clients expect. A trust is not required to utilize our investment expertise. Beckner’s Produce 6318 Booker T. Washington Hwy., Wirtz 540-721-2446 Hours: Monday–Friday 8am–6pm, Saturday 8am–5pm. Open March 1 through Thanksgiving. n	Produce grown here on the farm includes tomatoes, corn, cucumbers, beans, squash, melons, peppers, pumpkins, cantaloupes, eggplant, onions, potatoes and fresh herbs. n	Peaches and berries grown by the Beckners’ cousins are also sold here. n	They make canned food, baked goods and jams in an inspected kitchen. n	They sell local honey. Beckner’s is a family operation that was started in 1999. All fruit and vegetables are non-genetically modified. Produce is not organically guaranteed but is grown with as little chemical help as possible. An electrified fence keeps out deer, or there would be much less to buy! Fruit and Vegetable Market at Westlake n	Large variety of vegetables: Squash, zucchini, peppers, corn, turnips, tomatoes (including heirloom and yellow), okra, sugar snap peas, green beans, cucumbers, onions. n	Fruit varieties include blueberries, cherries, nectarines, and peaches. n	Plants and cut flowers are available. n	Grower states pesticides are not used, but no “certified organic” stickers on produce. n	Locally grown heirloom tomatoes, peppers, cucumbers and plants from Callaway. n	Non-GMO chickens (pesticide and chemical fertilizer free) $3.50/pound. Wawokiya poultry is raised in an eco-friendly environment, fed farm-raised soybeans and corn with no herbicides, pesticides, or genetic modification. Chickens are raised on grass pasture instead of cramped quarters where antibiotics and hormones are used to prevent sickness and encourage growth. Wawokiya invites you to visit them any time. 540-482-0577, jwalke13@gmail.com. n	Free range chicken eggs, pullet eggs, duck eggs. n	A wide variety of vegetables, fruits and berries, low-sugar jams and jellies, dried herbs, pickles and salsa. Scotts Strawberry Farm 5234 Joppa Mill Rd., Moneta 540-297-7917 Hours: Monday-Saturday 7:30am-7pm, Sunday 1-6pm Open mid-May through summer. n	Blackberries, blueberries, raspberries, strawberries, vegetables, local honey. n	Pick your own or already picked. Cash only. Buffy’s Blueberries 1038 Capital Hill Rd., Huddleston 540-330-5144, buffysblueberries.com Phone or email for hours. Blueberry season can last through September; blackberries are ripe in July. n	Four acres of blueberries in 12 varieties. n	Pick your own berries ($4/pound) or already picked ($6/pound). n	Farm fresh eggs available all year ($4/dozen). n	Tomatoes, cucumbers, squash and other veggies available in summer. ake life is about friends and family stopping by for a short visit, a day trip, or an overnight stay. We all want to focus on boating, fishing and relaxing on the dock, not a chore list. But you never know who might drop by, so before fixing that cold drink and slipping into an Adirondack chair, it’s a good idea to be prepared. Having supplies, a checklist, and a plan means you’ll always be ready to welcome friends and family, even on short notice. Assemble a basket of general cleaning supplies you can carry with you from room to room. Include paper towels or cleaning cloths, glass cleaner, disinfectant wipes, a spray bottle with vinegar and water, furniture polish, and shower cleaner. An enzymatic cleaner is great both for cleaning up spills and stains and for providing a fresh, clean scent. Stash a broom near areas that tend to need sweeping, and a good vacuum cleaner for the rest. Bagless vacuums are usually easier to empty, and either a lightweight model or one for each floor of the house will save time and effort. Covered baskets, bins, and lidded ottomans are attractive solutions for quickly stashing clutter when needed. A variety of shapes and sizes for different spots will come in handy. Steam cleaners are faster and clean better than mopping, and are less likely to leave streaks. Investing in one will make cleaning hard floors easier, and involves less fuss—no buckets! Always have clean bath and beach towels—you don’t want to run out at the lake! Having designated shelves or baskets and storing them in a specific spot helps you organize the house and makes it easy for guests. For the driveway and entrance to your home, grab a broom and sweep the front walk or porch. Pick up the welcome mat at the entry door and give it a good shake. water, so it will be clean and ready for the next brew. Spot clean the floor if you don’t have time to do the whole area—check around the stove and sink. Make sure any eating areas have clean and clutter-free table tops. In the main living spaces, fluff pillows, fold throws, and straighten coffee table books and magazines. Spot clean for dust and fingerprints, and stash remotes, games, toys, etc., on shelves or in bins. Powder rooms should always have fresh towels and supplies. Make sure the sink, mirror, and commode are clean and wiped down, and check behind the door and in corners for dust bunnies. If you’re having overnight visitors, go through the guest quarters to ensure fresh linens, and give table tops, dressers and nightstands a quick dust. Run the vacuum if needed. Guest tubs or showers get a quick rinse with shower cleaner, and give the handles a good scrubbing to make them shine. Put out a fresh bar of soap or a pump bottle variety; add a stack of clean towels and the bathroom is ready for company. Make sure glass doors and main windows are clean and sparkling to show off the view and welcome visitors to the outdoors. Putting up a flag on the dock shows you are home and welcomes guests. Consider hanging a sign prominently that declares your family name and makes it easy for boaters to recognize your place from the water. In the boathouse or dock box, stash an outdoor cleaner that fights mildew and algae, along with several terry cloth towels. Dock chairs get a lot of use and are exposed to the elements—use that outdoor cleaner on them if guests are headed your way. Glass cleaner is a quick way to polish table tops. Life jackets and paddles also stay clean with a periodic wipe of outdoor spray cleaner. Be sure you have a life ring that is in good shape, clean, and hanging in close proximity to your swim area. The outdoor cleaner and a rag will remove mildew as it builds up over the summer. Floats and noodles can be kept in a storage hut or large deck box to keep them clean, and refreshed when needed with that cleaner and terry towel.